Strengthen processing skills in adolescents and adults with memory impairments using the practical strategies in this book. Two skill levels are presented for each activity. 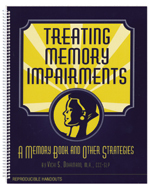 The book includes training materials and practice worksheets, informative handouts, reproducible memory book pages, and other useful materials.The book also includes information about the medical disorders that cause memory impairments, along with useful information about the brain and how memory works.